Laguna Niguel, CA, Orthodontist Answers: Invisalign Or Metal Braces? Top-rated orthodontist Dr. Kimball works daily to help transform smiles. A great smile transforms more than just your look; it can boost confidence and self-esteem. To choose between orthodontic treatment options such as Invisalign® or Damon self-ligating metal braces, it’s essential to consider important facts about them both. Clear aligners. Invisalign offers a discreet solution. The appliance can’t be seen when it’s worn. Customization. Your orthodontist specially customizes the clear, Invisalign appliance to move your teeth into their correct position. Removable Aligners. Invisalign’s removable aligners are not banded or bonded to your teeth. Instead, you wear each one for just two weeks before moving on to the next. Improved Comfort. Crafted from a special plastic with smooth edges, your Invisalign trays are designed for comfort and less irritation. Fewer diet restrictions. With Invisalign, you can still eat hard or chewy foods. However, you do need to remove the aligners when eating or drinking anything other than water. 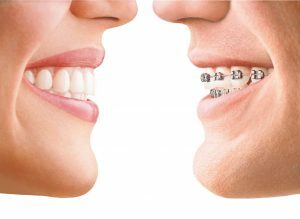 Metal braces correct a variety of issues, including crooked teeth, gaps, and other alignment imperfections. Advanced technology has allowed the creation and production of stronger, more resilient wires and appliances. These are not your parent’s braces. Today’s metal braces are smaller and less noticeable than ever before. It’s your color choice — pick a favorite color or the color of your sports team. Although both treatments achieve excellent results, for some people, having an option that is virtually invisible is a big part of their decision when it comes to their orthodontic treatment. Wearing Invisalign aligners grants you the freedom to enjoy your favorite food and transform your smile without your friends and loved ones noticing. Our orthodontic office in Laguna Niguel can answer any questions you have about Invisalign or metal braces. The information provided in this article is not meant to be medical advice and is for educational purposes only. If you would like to learn more about this and other topics related to orthodontics, feel free to contact Kimball Orthodontics, with a convenient orthodontic office location in Laguna Niguel, CA, by clicking here or by calling 949.363.3350.